While the love-assassins sent by your rival-in-love are out to destroy your quest for your sweetheart’s affection, Snowy your trusty dove helps you. What are their stories? Are the love-assassins truly evil? Why Snowy wants to unite the lovers? Why Blopty jumps when you tap him? Why Voracio is fixated on your love-notes? Why Crappigeo gives you that red-eyed evil stare when he is done crapping on your love-letters and envelopes? Click their images/links to understand their motives and their apprehensions. Snowy the Dove who tries to unite true lovers. 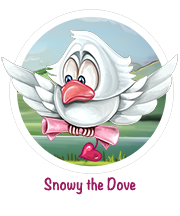 Snowy is a dove whose mission is to unite true lovers. She carries your love-notes/love-letters to your sweetheart. All you need to do is give her the envelopes that you have kept read for her. You must try to ensure that whenever Snowy appears on the horizon, you are ready with a packed, ready-to-send message, because your rival too is busy sending love-notes, and it would be sad if you lost your love to your rival! 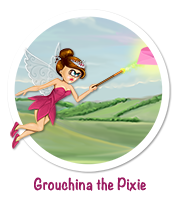 Grouchina the Pixie who zaps everything in her way and turns it to dust! Grouchina is a grouchy little pixie, who wants to become a great artist, and whose main reason for taking up this part-time assignment of zapping your writing material is to fund her art-supplies! If you give her a couple of cherries, she’d leave you alone (and even give you a smile,) but if you ignore her, she will zap away your notepapers and envelopes using a combination of a spell and some pixie dust. Grouchina isn’t really evil – but she sure is one disenchanted, disgruntled pixie. 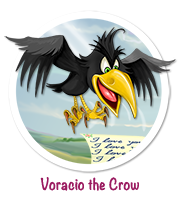 Voracio the Crow who is fixated on your love-letters. Voracio is your rival’s crow. He has been engaged by your rival to steal your blank notepapers and your love notes, and he takes his job very seriously. It’s almost impossible to save your material from this crow, because he doesn’t give up, until of course, you put you write on the blank notepaper. If he is after a love-note that you’ve already penned, you must quickly put it in an envelope, because Voracio’s contract with your rival doesn’t require him to go after your ready-to-send envelopes. Blopty the Bachelor Mouse who loves to shred but jumps on a tap! 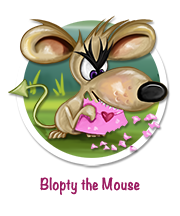 Blopty is a bachelor mouse who is in love himself. He is in love with the prettiest girl mouse in the whole world, and thinks that this assignment could help him win his love. So now he works for your rival, and his assignment comprises chewing up your closed, ready-to-dispatch envelopes. It’s easy to frighten Blopty and all you need to do to make him scamper is tap on him. Crappigeo the pigeon who hates Valentine’s Day! 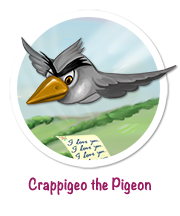 Crappigeo is a regular pigeon and a keen crap-maker like any other pigeon in the world, but what makes matters worse is that he cannot control his urge to crap anywhere, anytime. Your rival has recruited him to do what he does best. So Crappigeo’s job is to fly around and crap over your letter-writing material. Right after you’ve penned a lovely message that tells your sweetheart how much you care, Crappigeo takes care of it! 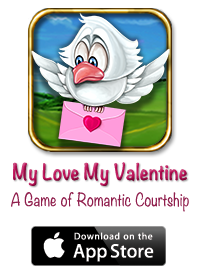 Pingback: Nifty's Diary » Blog Archive » My Love My Valentine – MLMV HD for iPad – a game for every Romantic Heart!